A new trailhead into the Franklin Mountains in El Paso. Trail users will find new bicycle repair stations for fixing flats, drinking fountains with a combination of spouts for humans and pets, trashcans, dog waste stations, helpful signage, and ADA-accessible parking. A surprising new amenity is the solar-powered phone charging station. “A solar-powered charger located at another trailhead proved so popular we made sure to include them in our own plans for these new trailheads,” says City of El Paso Parks and Recreation Director Tracy Novak. Solar technology will also power security cameras should the need arise. The solar power is free, but trail users will need to pay a park entrance fee to utilize the trails. The fee is $5 per person per day for anyone 13 and older (12 and under free) and can be purchased at trailhead self-pay boxes. Trail maps are also available at the Tom Mays Unit and the McKelligon Canyon headquarters in the state park. Round House, heading the 1-mile Round House Trail on the city’s northeast side. The trailhead is located on preserved ranchland along Martin Luther King Jr. Blvd, approximately 1.3 miles north of Loma Real Avenue. Lazy Cow, also on the northeast side, is located in a suburban neighborhood on the edge of developed land. Find it at the end of Officer Andrew Barcena Drive. Lazy Cow heads the 2.7-mile Lazy Cow Trail. Thousand Steps, constructed in an established, westside neighborhood adjacent to the state park, heads the challenging 1.64-mile Thousand Steps Trail with its elevation gain of almost a thousand feet. Find it next to the EPWU water storage tank at the end of North Stanton Street. 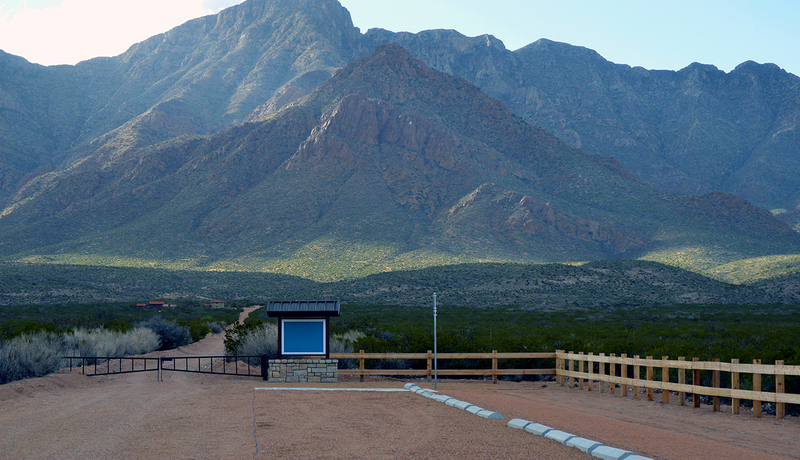 The Jan Sumrall Memorial Trailhead, named in honor of a former El Paso city council member and community volunteer, serves the westside .85-mile Thunderbird Trail. It’s located adjacent to an EPWU water tank site along Thunderbird Drive. The new trailhead construction is courtesy of a joint agreement between the City of El Paso, Texas Parks & Wildlife Department, and El Paso Water, the utility that provides water and wastewater services to the greater El Paso metropolitan area. TPWD owns the trails, EPW owns the land where the trailheads are located, and the City of El Paso provided the funds to build the trailheads.